Some six years have passed since Eagle Twin released their second album, in which the crows that fought the sun on their debut recording fell to earth transformed into snakes and threaded themselves into human culture through snake-based myths to be redeemed. These two albums formed an entire cycle in themselves so perhaps I should not be surprised that Eagle Twin took their time to embark on a new and perhaps musically different journey. And so they have: Eagle Twin have based their third album around the hoofed animals of their homeland in Utah – the pronghorn antelope, the deer and the bison – and their role in the ecological cycle of the area, with perhaps a message about how the mightiest animals of the prairies can become food and shelter for the tiniest creatures, as in songs like “Quanah un Rama” which incidentally and cheekily references Eagle Twin’s Southern Lord stablemate Earth’s album “The Bees made Honey in the Lion’s Skull” in one line. Lest you be afraid that the passage of six years might have mellowed Eagle Twin’s music, banish those fears now for here comes a truly thunderous and earth-shaking sound, with powerful drumming, a deep crumbling guitar sound and above all, Gentry Densley’s shamanic throat-singing with the eerie high-pitched whistling drone and the gravelly rasp going at once. On the opening track “Quanah un Rama”, the musicians literally throw their thunderous weight around, kicking up huge mounds of earth with massive riffs hard enough to break a buffalo’s leg, and swaggering about as if glad to throw off six years of heavy grass-munching rumination. By contrast, “Elk Wolfv Hymn” is a more restrained song, starting a bit dreamily and quietly, but quickly swelling to a mighty wave of muscular riffing, lightning-fire lead guitar, clashing cymbals, stuttering drums and almost shrieking if still rasping vocal, as wolves and vultures close in and pounce on their prey. The second half of the album is a more doom-laden Sabbathy affair with Eagle Twin revelling in throwing heavy riffs and Densley’s strangulated rocks-in-throat singing: he must be throwing down pure fiery alcohol down his oesophagus to get that crushed-gravel effect. Rhythm guitar crunches away the way a machine monster chows down on asphalt roads and spits slabs out the sides of its jaws and lead guitar scrabbles over thumping beats and percussion. Songs may be long but the music, however pounding it is, is so energised and full of molten lava fire, that it sweeps you off your feet and takes you to where the vast Rocky Mountain desert vistas touch the skies in the far horizons. “Antlers of Lightning” fuses antelope and nature together in a way that evokes ancient mythologies of hunter-gatherer peoples and invests the galloping of hoofed creatures with a spiritual meaning. They become emissaries between humans and the supernatural forces of the universe. Likewise the music is infused with almost inhuman energy as fiery lead guitar snakes away in white-hot electrical lines and rhythm guitars and percussion churn, crunch and pound away with demonic force. 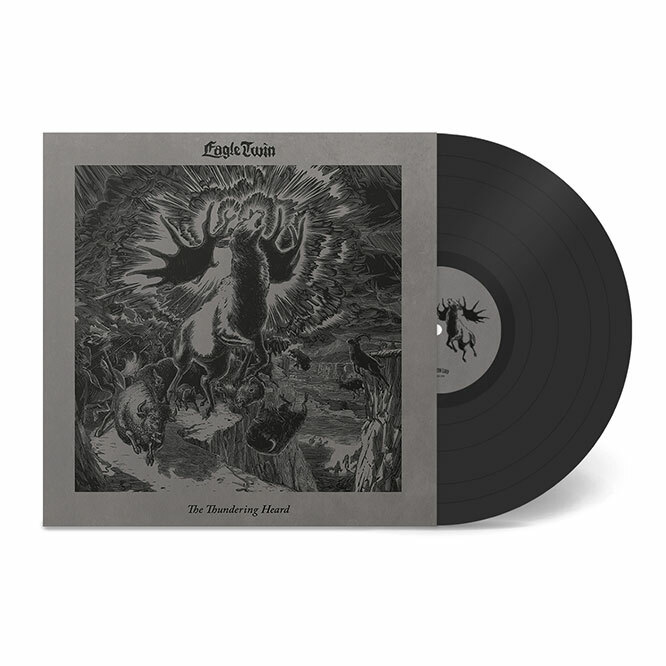 Taking inspiration from blues and improv, Eagle Twin have created an album rich in Native American and Western mythology and references, and adding to those their own myths of creatures coming down from above to take on the forms of prey to carve up mountains and canyons with hooves that strike fire and electricity wherever they go, daring wolves and human hunters to take them on. While the music is essentially still stoner sludge doom, it takes on an almost inhuman and electrified psychedelic aspect. Densley’s throat-singing style is better integrated with the music than on previous recordings. The outstanding feature of “The Thundering Heard …” is its sheer confidence, exuberance and fearlessness. Next Post:Skullflower vs The Dead C.